The rate of poverty among U.S children has been increasing. Children comprise 40% of the U.S American poverty population. Poverty erodes the nutritional and health status of children. Many homeless individuals eat fewer meals per day and are more likely to have inadequate diets and poor nutritional status in comparison to individuals with stable living situations. This is also linked to other negative conditions such as, inadequate nutrition, inadequate child care, lack of access to health care, unsafe neighborhoods, and underfunded school districts which greatly impact children. Homeless children are at a greater risk for poor academic achievement, dropping out, abuse, neglect, behavioral issues, socio emotional problems, physical health problems, and developmental delays. Maternal malnutrition during pregnancy increases the risk of premature birth, smaller head size, and lower brain weight. Premature babies are vulnerable to an increased risk of developing learning problems when they reach school age. The first 3 years is a period of rapid brain development in children. Too little energy, proteins, and nutrients during this sensitive period can lead to lasting deficits in cognitive, social and emotional development. Protein malnutrition, iron, iodine, zinc and other vitamin deficiencies can cause brain impairment. Hunger negatively impacts a child’s motor skills, activity level, and motivation to explore their environment. Families often work to hide food insecurity and some parents may feel embarrassment that they are not able to feed their children. Children may also feel stigmatized, isolated and ashamed by their lack of access to food. Hungry children are more likely to repeat a grade, receive special educational services, and mental health counseling. Hungry children are 7-12 times more likely to exhibit symptoms of conduct disorder (fighting, trouble with teacher, not following rules, stealing) than their non-hungry peers. Hungry children show increased anxiousness, irritability, and aggressive/oppositional behavior in comparison to other kids. Lastly, multiple stressors associated with poverty result in a significantly increased risk for developing psychiatric and functional problems. The effects of undernutrition depend on the length and severity of the period of hunger. Effects of early undernutrition are not permanent, with better nutrition, environmental stimulation, and emotional support a child can lead a healthy life. The human brain is very flexible and can recover from early deficits but brain structure can remain vulnerable to further negative experiences throughout childhood. Starting in Fall of 2017, Chicago HOPES for Kids expanded our capacity beyond literacy to include a strong focus on mathematics in our after school program. In considering our implementation of this program, we were initially inspired by two sources: 1) the new direction of Common Core math, which puts new emphasis on a big-picture understanding of math and often associated with right-brain learning and 2) a discussion of trauma-Informed teaching practices. Trauma can be thought of as a deeply disturbing or distressing event, either a single event or chronic, that leaves a lasting psychological impact. It is impressed on the right-brain, which is associated with sensory input and episodic memory recall. Trauma doesn’t disappear. It can be triggered by words, facial expressions, smells, and many other experiences. This causes aspects of the toxic stress of the initial event to superimpose onto normal situations. While these symptoms may have been helpful in surviving the traumatic event,.they become maladaptive in normal situations. People with trauma, especially children, are often not able to understand that these perceived threats are not real, and it requires leap of faith to accept this counterintuitive notion. However, there is a neurological Catch-22. A trauma-reaction involves a high level of activity in the amygdala, the part of the brain that is responsible for “fight, flight, or freeze” reactions. Due to this, the prefrontal cortex, which is responsible for analytical abstraction, becomes inactive. The ability to think in abstraction, which would be helpful for differentiating reality from the trauma reaction, becomes unavailable during the trauma response - meaning logical thought isn’t happening. A recent brain imaging study from Stanford University discusses the neurological reaction of people with math anxiety when faced with a math problem, and it looks a lot like a trauma reaction: high activity in the amygdala and low activity in the prefrontal cortex. Interestingly, this reaction did not occur when the researchers presented both groups with spelling problems, even if they were difficult. Research has shown a close relationship between math and executive functioning that doesn’t seem as strong with other subjects, which are often more focused on memorization of content rather than performing mental tasks. This reflects a deep learning process, unrelated to rote memorization. If students feel or experience a threat in the process of learning, their attention to the task is disrupted because they pay attention to the (real or perceived) threat. When this happens, the prefrontal cortex, where problem-solving takes place, shuts down. One way to interpret this is that some people have experienced trauma in some way associated with math, and this trauma prevents a math-anxious person from beginning to work on a problem. The children we work with tend to have a high incidence of trauma which may have been compounded by experiences at school. This could result in an even more complex negative reaction to math. Given math’s heavy engagement with executive functioning, this has the potential to become even more disadvantageous for our students. Significantly, the Stanford researchers found that when the math-anxious person actually began to work on the problem, their neurological activity approached that of the control group who did not have math anxiety. The important factor in this was overcoming the initial response that prevented the individual from beginning the problem. On some level, the brain anticipates similar trauma to ensue so it prevents the process from beginning. Overcoming this anxiety requires that we actively interact with our own brain. The fact that mental activity physically changes the organization of the brain, known as neuroplasticity, is significant. The result is that new physical and mental behaviors that can become habitual through repeated engagement. This is evident in the way trauma is permanently impressed on the brain, resulting in a learned behavioral reaction, but also in the way we can overcome this trauma by learning and establishing new responses to our trauma-reactions. In fact, this is a tenet of Cognitive Behavioral Therapy - a highly flexible form of talk therapy - where people learn to change unhelpful thought patterns underlying problematic behaviors. Neuroplasticity is a double-edged sword and it is in our best interest to learn to use it with intent. 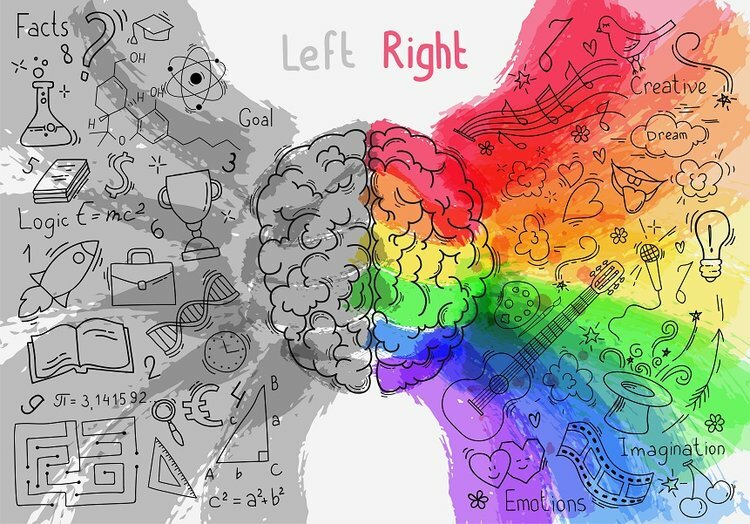 At the end of the day, our left and right brain are supposed to work together like our left and right hands. We can use right-brain thinking and understanding to get the left-brain unstuck from trauma and anxiety responses. Then, we can use left-brain analysis to reflect on what just happened and intentionally direct our capacity for re-learning. After repeating this process multiple times, the plasticity of the brain allows the new behavior to become the norm. We come to believe through experience that we can solve the problems we encounter, meeting less and less resistance as the new pathways become more established. Math is a powerful subject, and has the potential make or break a child’s educational experience. Its engagement with executive functions in the brain can cause experiences with math to either have lifelong benefits or become traumatic and compounding. Also, considering its central importance in STEM and business fields, a student’s experience with math can be extremely empowering or disabling. A trauma-informed approach is a best practice for math education and for life in general, and the right-brained methods of Common Core math offer us a new world of opportunities for helping children with this potentially challenging subject. Thank you! You are now subscribed to receive news and updates for Chicago HOPES for Kids.